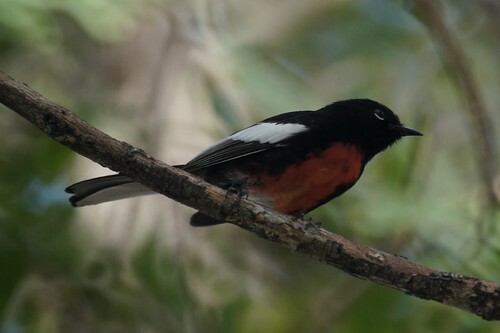 Mike has been wanting to see the Painted Redstart that had been reported in San Diego for a few weeks. We left early today about 7:30 am for the drive down. The bird did not disappoint! It was still hanging out in the same tree it was earlier seen in, and it was a fun bird to watch. It would frequently chase the Townsend Warblers out of the tree and then come back to its favorite branches. It is quite acrobatic and fast moving. It is next to a fairly busy road, but when traffic would calm down, we could hear its call. We spent some time watching it around 9 am but it was a bit cloudy, so we left for some other birding spots and came back to it around 11 am. The second time the light was better and we stayed about an hour. A few other birders were there enjoying it too.